Sitting: Tatiana Pérez and Isaí Echevestre. Standing: Nayelis Echevarría, Catherine Ríos, and Noel Soler. 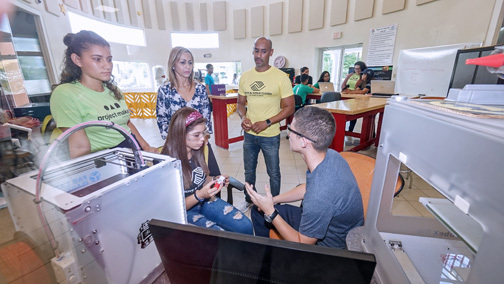 FirstBank has joined Boys and Girls Clubs of Puerto Rico as a sponsor of the nonprofit’s Innovation and Entrepreneurship Program and the Digital Fab Lab located at the club’s site in Isabela. The program focuses on developing careers and entrepreneurship, providing the tools necessary to obtain worthy jobs that will bring them economic security. For more than 50 years the Boys & Girls Clubs have been supporters of girls, boys, and youth 6 to 18 years of age, on a daily after-school basis. “At FirstBank we promote entrepreneurial programs and projects such as the Fab Lab, recognizing that they offer children and youth the opportunity to begin developing their entrepreneurial skills,” said Catherine Ríos, community compliance and reinvestment officer at FirstBank. “The workshops give students an opportunity to combine their learnings with their talents in order to shape their future. They are an essential complement to academic instruction and go hand in hand with the leadership skills and social awareness these young people also acquire in the Boys and Girls Clubs in Puerto Rico,” she said. Every day, participants in the Innovation and Entrepreneurship Program grow and develop an entrepreneurial mentality through the age-specific curricula taught by Club leaders. The program has resources such as 3D printers, equipment, tools, and machinery with digital systems that allow participants to work with a wide variety of materials of different volumes. “The Fab Lab curriculum offers our participants the opportunity to learn, create proposals, and present ideas for solving problems and finding their own solutions in a self-management environment. In our new innovation spaces, young people develop ideas that will enable them to become entrepreneurs,” added Noel Soler, director leader at Boys & Girls Clubs in Isabela. Hey Buddy!, I found this information for you: "FirstBank joins Boys & Girls Clubs to support young entrepreneurs from Isabela". Here is the website link: https://newsismybusiness.com/firstbank-support-entrepreneurs/. Thank you.